Outer layer of the coat is long and wiry. The inner layer is short and soft. Colors are sable (with and without black tips on the hairs), black and tan with white markings, black-white, and blue-black. This dog is loyal, obedient, sharp, and happy. This dog is loyal, obedient, sharp, and happy. Although watchful around strangers, this dog is extremely sociable with children, other dogs, and household pets. You can find Sheep Dog puppies priced from $250 USD to $2200 USD with one of our credible breeders. Browse through our breeder's listings and find your perfect puppy at the perfect price. Although watchful around strangers, this dog is extremely sociable with children, other dogs, and household pets. Regular grooming with a brush and comb is required. The long outer hair can get tangled. This breed is not hard to train. It loves to learn and likes to be busy. It enjoys taking part in agility competitions. 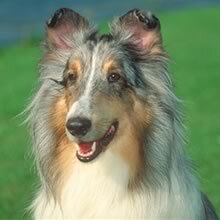 While the Shetland Sheepdog will adapt to life with a more sedentary family, it needs to get out, work, and learn. It enjoys taking part in outdoor activities, and performs well in many areas of dog sports. Sheep Dog Puppies for Sale - Shipped Worldwide! Finding the right Sheep Dog puppy can be dog gone hard work. PuppyFind® provides a convenient and efficient means of selecting and purchasing the perfect Sheep Dog puppy (or Sheep Dog puppies) from the comfort of your home, 24 hours a day, 7 days a week. Take advantage of our PuppySearch or leisurely browse our directory of hundreds of dog breeds, Sheep Dog dog breeders, Sheep Dog dogs for adoption, and Sheep Dog puppy for sale listings with photos and detailed descriptions. Some Sheep Dog puppies for sale may be shipped Worldwide and include crate and veterinarian checkup. Many Sheep Dog dog breeders with puppies for sale also offer a health guarantee. With thousands of Sheep Dog puppies for sale and hundreds of Sheep Dog dog breeders, you're sure to find the perfect Sheep Dog puppy.